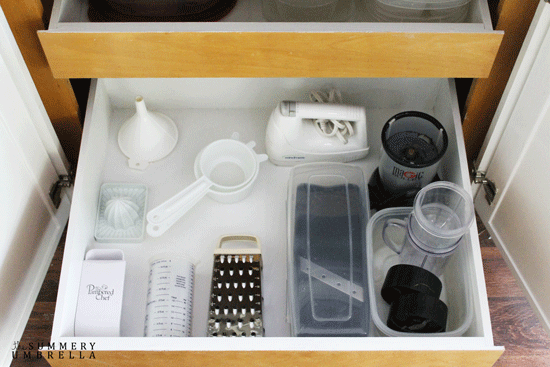 If you have a disorganized kitchen cabinet like I did, here are 5 steps you can take to organize your kitchen cabinet. 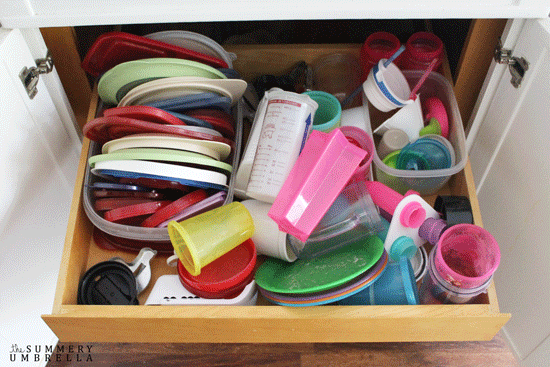 It’s so easy to forget how messy your cabinet actually is when the doors are closed. See… isn’t this pretty? Sigh. However, I know the “organized look” of this cabinet is only skin deep. Once you open up this beauty it is complete and utter chaos! I knew I needed to get started on this one for some time now, but I always had an excuse for putting it off. 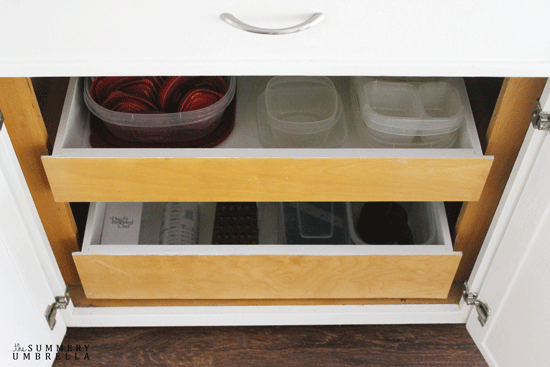 Thankfully though, I finally dug deep and developed these 5 simple steps for an organized cabinet. I hope they help you as much as they helped me. 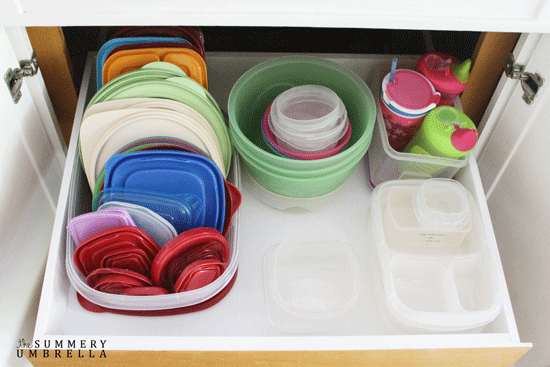 You really can have an organized kitchen cabinet that stays that way. Yikes! I’m almost embarrassed to post this one. Oh well, we all have flaws. Mine are in my cabinets. Hah! Pull everything out of the cabinets. This is the only way you will be able to see how much you have. 3. Get rid anything that doesn’t have a matching partner, or that you no longer use. I know, I know. You’re going to “find” that lid some day. Trust me. You probably won’t. 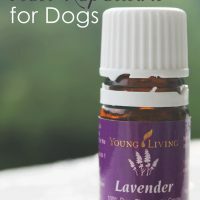 Especially if you have a toddler and dogs. It’s gone. 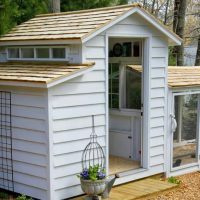 Getting rid of things you can’t use properly will free up room for everything you do currently use. 4. Paint it up, baby! Paint is a miracle worker. While this drawer looks just fine in this color you know it would look a hundred times better if it was white. Isn’t this refreshing? Love it! 5. Put everything back neatly. Last, but not least… organize what remains. I used a larger plastic container to hold my lids. You might need some boxes, baskets, or something to keep them all contained. Now all I have to do is get my “roommates” on the same page. P.S. Did you see my last post on 5 Reasons I Got Rid of My Linen Closet Door? Definitely, a must read! Ok so don’t laugh… I made a pull out storage drawer for under my sink and I LOVE IT!! Well, the hubs had to get under the sink to fix the disposal and took the drawer out and when he put it back in??? He basically just stuck stuff everywhere. I was determined not to let my OCD get the best of me but yeah, I’m heading upstairs to straighten it up now. 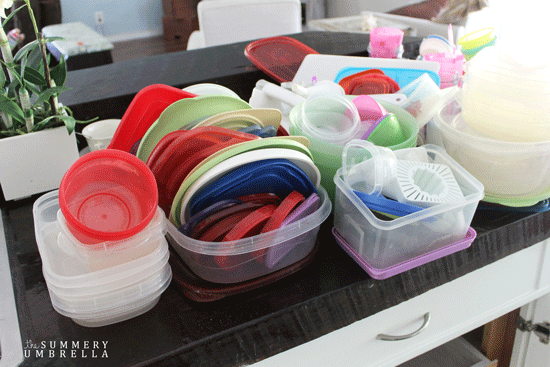 I am by no means the tidiest person, but I absolutely cannot stand disorganization! 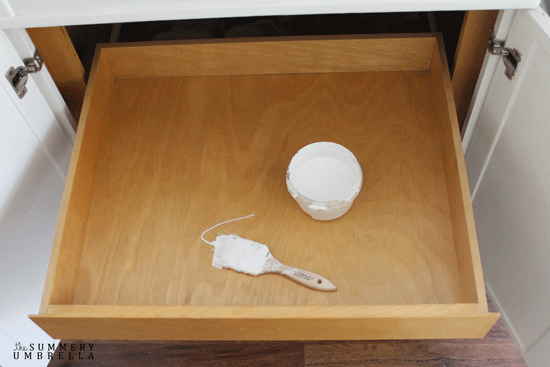 I do love the idea of painting the drawer. Makes the finished product that much better. By the way, I would love to have you post on my new blog hop—the Weekend Blog Hop at My Flagstaff Home (www.myflagstaffhome.com). It begins on Thursday evenings and lasts through the weekend, if you’re interested. 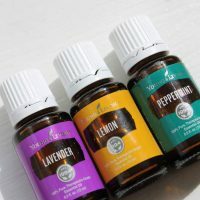 I love this post and I’m excited to read your blog. Hi LZ, here from Inspire Me Monday. I’m working really hard on organizing. Before I moved (3 weeks ago), I threw out all (ok, most) of the non matching things. And the most of the sippy cups went to my daughter, who doesn’t live with me anymore. Hi Melinda! Don’t worry. You are not alone! It is extremely hard to get organized. When my husband and I first got married, and all my stuff (aka. junk) started piling onto the moving truck he asked me countless times why I was keeping some of the items. I never had a good reason, but at least we are both learning, right?!? Love the idea of painting the drawers! It does make everything looks clean and neat! Appreciate you taking the time to visit and share with us at Brag About It! Oh my gosh, THE LIDS!!! I hate those things. They never sit right in the cabinet and if not put back properly they fall out and bonk us on the head. This has motivated me to get it organized! 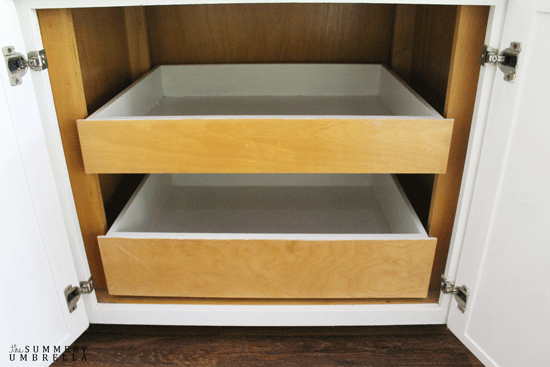 Great tips to get the cupboards in shape! Now all I need to do is keep my toddlers out of them and they will stay pretty! ;) Thanks for linking up at Wonderful Wednesday. I am pinning this! This is definitely a “do every now and again” job isn’t it? Those lids and containers seem to loose their partners on a regular basis! When ever our drawer looks a bit messy I find getting rid of the oddments and putting it all back neatly makes me feel good every time I open it. No kidding, Julie! I feel like I’m constantly doing little projects like this to keep everything under control. You’d think that they would invent more containers attached with little hook-ons for the lids. You know the thing I’m talking about? We used to use them with my daughter when she was a baby to ensure her gloves stayed hooked to her coat so she didn’t lose them. Lol.